Airlines say screenshots of high prices circulating on social media are incorrect. As Hurricane Irma makes landfall in the Caribbean and heads toward the US, parts of Florida, South Carolina, and Georgia are under states of emergency. Serious damage has already been reported in the French Caribbean territories of Saint Martin and Saint Bart's. But some who are trying to book flights out of Miami or South Florida claim airlines have dramatically raised their fares in the past 24 hours. John Lyons of West Hartford, Connecticut, was able to book a $160 flight with American Airlines for his daughter out of Miami. When he tried to book the same flight for a family friend's daughter, he said AA was "gouging for the same ticket to the tune of over $1000." Lyons told BuzzFeed News that his friend's daughter, unable to afford these fares, was left "stranded" in Miami. She's since decided to try driving "up north," he said. A rep for American Airlines told BuzzFeed News they have not changed their pricing structures, and flights out of Miami are simply "selling out really quickly." The company is trying to add additional flights, she said. "We are doing everything we can to get our customers out of the way of Hurricane Irma," said Katie Cody, senior manager of communications at AA. "We’ve been able to add a flight or two when we can, but it’s a puzzle to move in additional planes." She added that AA will not charge customers change fees for rescheduling flights for those who already hold tickets during this time. A recent search showed there were no AA flights available leaving Miami on Thursday, but a flight leaving Wednesday was priced around $909. Lyons said he has not heard from anyone at the company, but he does hope they will take more action to help those trying to evacuate. "If they want to make an offer, offer to discount some fares for people stranded in Florida," he said. "They can handle some losses on a few flights." 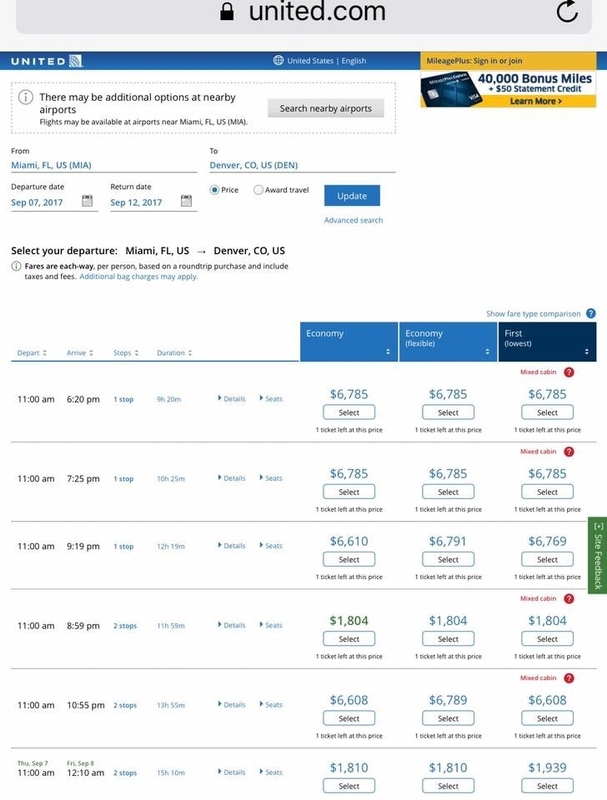 People are also circulating search results of United Airlines flights leaving Miami to various US destinations with fares around $6,800. But a United spokesperson told BuzzFeed News these were unique prices for larger, wide-body planes normally used for international flights that have been brought in to this domestic route. The spokesperson said the prices listed were for first-class seats mistakenly listed as economy. “Since we don’t typically fly those planes on those routes, there was a glitch in the system as far as how much those typically first class flights would cost," the spokesperson said. Based on a recent flight search, United flights are no longer available out of Miami on Thursday to Denver. 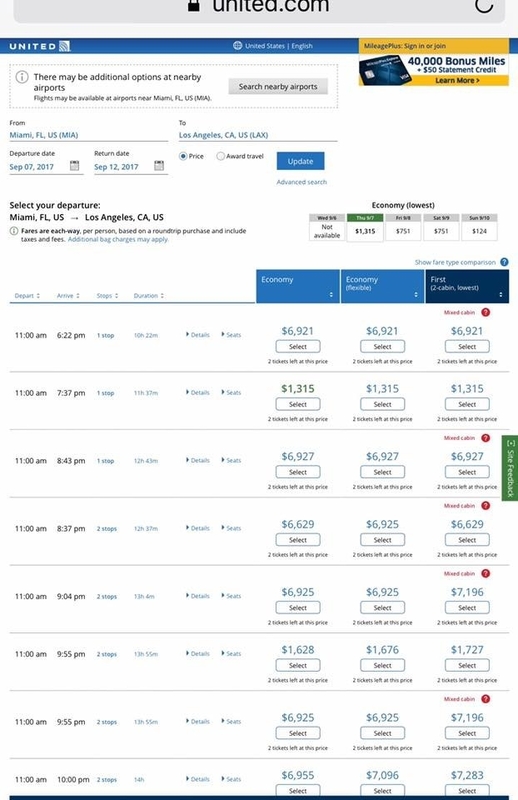 There are still a few options for Miami–Los Angeles flights, however, which are currently priced from $768 to around $1,600. "We haven’t changed the ways we price our flights," the United spokesperson said. "We’ve added additional flights out of Florida but those flights are mostly sold out. We don’t have a very large operation down there." In a tweet that's gone viral, user @LeighDow called out Delta Airlines for a notice that stated prices of outbound flights from Miami to Phoenix on Wednesday have risen from $547 to $3,258. But a Delta rep told BuzzFeed News this was a pricing error on Expedia, the search engine that was used by @LeighDow, and the company since been in touch with her and offered her a "much lower fare." "When they reached out directly to Delta, she was given a much lower fare," Delta spokesperson Trebor Banstetter said. "We’re looking into why Expedia listed that price, but it was not the correct fare." "We have not increased any fares in response to the hurricane. In fact, as the storm approach we reduced the price level of our highest fare," Banstetter added. A recent search showed there were no longer any Delta flights available from Miami to Phoenix on Wednesday or Thursday. The company said they're trying to add more flights. "We have added flights and upsized aircraft on flights out of San Juan and south Florida, providing more opportunities for customers to leave," Banstetter said. "New flights are being added to and from Miami, Palm Beach, Fort Lauderdale and Key West, all to Atlanta." Delta is also waiving any change fees due to Hurricane Irma. UPDATE: American Airlines has decided to cap "pre-tax fares at $99" for flights leaving out of Florida that are purchased through Sunday. "While there are limited seats remaining before the storm hits, we will cap our pre-tax fares at $99 for MainCabin seats on direct, single leg flights out of Florida for tickets sold through Sunday Sept. 10 for travel until Sept. 13," the company told BuzzFeed News on Wednesday.